The last two weeks have slowed down a bit...really there are only a handful of birds that I can see this time of year that I haven't already seen. I went to Van Cortlandt Park in the Bronx to see the local population of Rusty Blackbirds, and got some nice close looks. I also spent some time out in Eastern Long island, including a full day on Shelter Island trying to see an elusive White Winged Crossbill (no luck). Today in Prospect Park, though, it seems that things are beginning to pick up again, and there are signs that spring is on the way. Common grackles where perched in trees around the lake, and there was a lot of bird song. I ran into Rob Jett (www.citybirder.blogspot.com) and we watched Alice and Ralph, a mated pair of Red Tailed Hawks, working on a new nest for the breeding season. Trees in the park are starting to show a little color, and we even saw some early blooming flowers in the Midwood. 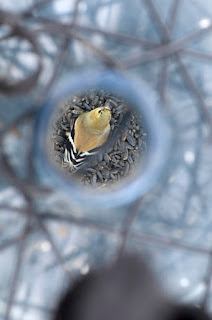 The cycle of life is coming back around, and I had a vivid look at that cycle on Breeze Hill at the bird feeders there. 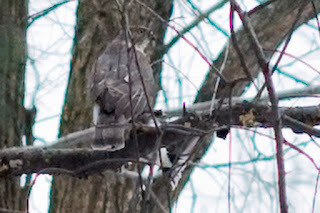 When I came up on the feeders a Red Tailed Hawk flushed, and there were no birds around, with one exception. One of the feeders is a 5 gallon water cooler tank with holes in the base, and inside that feeder, fluttering around frantically, was an American Goldfinch. I found out later this wasn't the first time the bird had gotten itself inside the feeder...it had been trapped and released several times. It took me a few minutes to get the feeder down, and then another ten to guide the worried bird back out of the hole it came in through. The little bird's trial was over, and it perched briefly on the feeder before flying towards the nearest branch. Before it could reach it's perch, though, an accipiter (either a Sharp Tailed or Coopers hawk) snatched the bird out of the air, landed in a nearby tree and camly began eating the goldfinch. If not the cycle of life, definitely a very rapid turn of fate. I got back late from Ithaca and then got up early to meet Paul Keim and his friend Carol to go look for owls in Pelham Bay Park. I posted about Paul's owl trip to Croton Point in December, and was looking forward to doing more owling with him. Paul is an owl expert, and is great at finding these hardest-to-find birds. 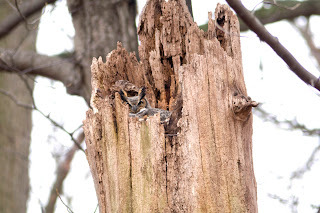 Our first stop was an old tree that has hosted a pair of Great Horned Owls for a number of years...these birds mate for life, and this is their nesting season. The female was sitting where Paul expected her, probably with eggs. She watched us with an unwavering stare for the few minutes that we spent there, and we kept a careful distance to avoid disturbing her. It's always exciting to see an owl, both because they are rarely seen and because they seem so different from other birds. I felt lucky to have someone like Paul willing to show them to me. We moved on to another area (yes, I'm being intentionally vague...it's understood with birders that you don't reveal an owl's location, since they are easily disturbed), and Paul met up with another local birder who pointed out several Saw Whet Owls...all in all there were four in this spot, and we saw two. Whereas the Great Horned Owls are big, impressive and intimidating, the Saw Whets are tiny and would almost seem cute except for their purposeful talons and hooked beak. 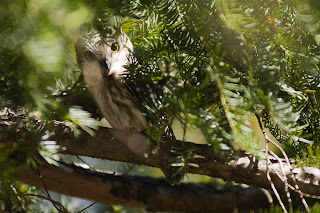 We spent some time working though more pine trees, looking for owl sign, and found yet another Saw Whet. Owlers look for "whitewash", which is owl poop, and for pellets, which are regurgitated, undigestible parts of the owl's prey. 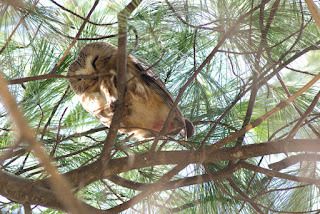 Here we saw lots of whitewash on the branches of a pine, and right above it was another owl, not three feet from us. This is another amazing quailty of owls, their ability to completely camoflauge themselves, so that you can be looking almost directly at them an not see them. We actually jumped back we were so close to this one. We took a few photos and then moved on to leave the bird to rest. Our last spot was another pine grove in a mucky area, and we spent half an hour working through it. There were definitely signs of owl here, but we couldn't spot the birds. 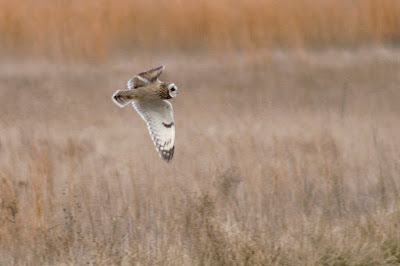 We were on our way out when I happened to look back and caught the flash of a bird in flight...an owl! We backtracked to where we'd just been looking, and two Long-Eared Owls flushed out and flew past us. They seemed huge, even though they aren't as big as the Great Horned, and it was incredible that they could navigate through the dense branches of the pine grove with such speed and agility. They perched off about fifty feet from us and we got some good looks as they got good looks of us. In the car it was just a short drive before we were back in the middle of New York City. From Long Island I drove straight up to Ithaca to look again for the Pacific Loon. 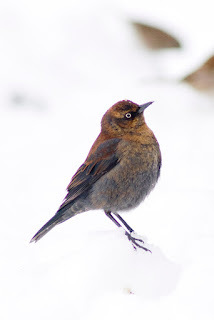 Another rarity for New York, this bird has returned to Cayuga Lake each winter for several years now. I'd already tried twice for this bird when I went up to see the Ross's Gull, but I was hopeful the third time would be the charm. That said, this is not an easy bird to see. Cayuga is the largest of the Finger Lakes, and the loon seems to move around quite a bit. Also, loons are diving birds, and when the bird is feeding it's underwater more often than not. I watched a Common Loon on the lake dive and stay under for at least two minutes, to reappear many hundreds of yards away from where I first saw it. That means that you might be looking at the exact spot where the bird is, but if it's underwater you can still miss it. Cruising slowly up along the shoreline searching for the bird, it feels a little like looking for the Loch Ness Monster. So that's what I did...I drove very slowly along the shoreline, stopping in spots, using bare eyes and binoculars, looking for the bird. For two days. And altough I saw a number of Common Loons, I never saw the Pacific. There were other birds to see, of course. On the north end of Cayuga there was a group of thousands of Redheads, several hundred Ring Necked Ducks, and over a hundred Tundra Swans (much easier to photograph than the Hook Pond swans). 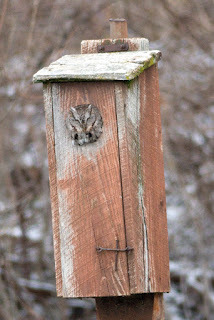 There was even a screech owl in a nesting box near the lake. The highlight of the trip happened as I was driving up the east side of the lake...I saw a large flock of geese approaching as I drove up route 90. They came closer and I saw that it was well over one thousand snow geese, cruising up along the lake edge in a loose formation. At some point we intersected, and for at least a minute or two I had the geese flying right above me...at 45 miles an hour, the birds were still passing me! I took some don't-try-this-at-home shots through my sunroof as I drove, and then the birds finally veered off and flew out over the lake. It left me laughing out loud. The last few days have been "clean-up" for me, meaning looking for birds that aren't real rarities but that I'd like to get out of the way. 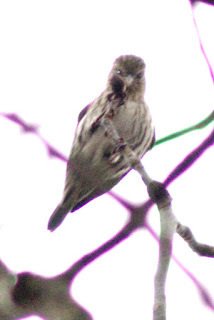 First stop was Connetequot State Park on Long Island for a reported group of Pine Siskins. Like many of the spots I've visited in the last month, I realized that I'd been to this park before I started birding: Connetequot has a fly-fishing only trout stream that you can fish on, and I'd done that years ago. A place can seem completely changed when you approach it with a different intention, or new knowledge. I'd visited Niagra Falls, for example, when I was photographing tourist spots, and Niagara can be seen as a ticky-tacky place. My last couple of visits, though, have been to the Niagara Falls that is known by birders as a mecca for gulls in the winter...probably the best gull-watching spot in North America. Prospect Park, which for nearly 15 years it was place to walk my dog or have a picnic, has been transformed into a group of spots like Lamppost 249 or Rick's Place or the Killing Field, each a different bird habitat. It makes me wonder what else I don't know, that might change how I see places again. Philosphical discussions aside, I got down to birding and with some help from the park workers found the spot where the siskins had been feeding. Sure enough, up in the trees above the feeders, there was a group of 20 or so Pine Siskins perched and preening. The light was not flattering, but I managed a few photos and moved on. I was hoping to get all the way to Montauk to look for Red Crossbill again, but never got that far. I worked Dune Road and found the Boat-Tailed Grackles again, and got some better photos of a Common Loon diving in Shinnecock Inlet. 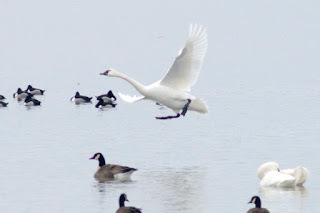 I also got a few slightly better shots of the Tundra Swans on Hook Pond. Part of "clean up" for me is also getting better shots of birds I've already seen this year. I ended the day at Calverton at the old airport there. This is one of the only (if not the only) spots to see Short-Eared Owl and Grasshopper Sparrow on Long Island. 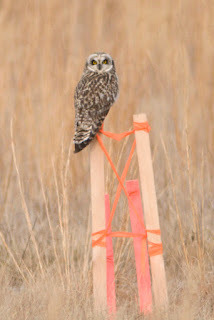 After poking around I wound up in the parking lot by the airstrips there, and sure enough there were four Short-Eared Owls perched out on posts by the fields. Short-Eareds are wonderful to watch, especially for the fact that they often hunt in the day, so you can get great looks of them cruising grassland areas before dusk. These birds did not dissapoint, and soon were gliding over the grasses for voles and mice. Their prey scampers under the matted grasses and are hard to see, but they can't hide from the incredible hearing of the owls, who will interrupt a graceful glide with a sudden swoop down to the ground, to emerge with a rodent in their talons. There were a couple of other people there, and we also go to see possible breeding behavior in the birds...two owls would soar up into the air and then flutter around ear other, almost locking talons, and fall back towards the grasses. This is around the breeding season for these birds, and I'm told that it's not unlikely that this was a courtship behavior. All the more infuriating then, to have the town of Calverton hellbent on destroying this rare grassland. (Click here for a Newsday article). The current plan is to bulldoze the entire place to put in a 37-story indoor ski slope. I'm no expert, but to me the plan smacks of the "Monorail" episode of the Simpsons from years ago, where a huckster convinces the town of Springfield that it needs a monorail and drains them dry. The plans are set, but these owls may put a wrench in the process...Short-Eared Owls are endangered in New York State, and this is a well-known habitat for them. There has to be an environmental review, now, and there's a possibility that the owls will stop the development. I'm praying that it will be so...I can't imagine something less valuable than an indoor ski slope, or more valuable that one of these rare grasslands, and these beautiful birds. I did my first pelagic trip of the year yesterday; it was run by Paul Guris of See Life Paulagics (www.paulagics.com) Pelagic birds are birds that spend almost all of their life over water. They live on the ocean and come to land only to breed, often in some remote spot in the Arctic or on a desolate island somewhere. The best (and sometimes the only) way to see these birds is to get on a boat and cruise offshore. The trip left from Freeport, Long Island at 6:15am, and there was a sizeable group of people that were willing to get up that early and stand outside on a boat in February. The day was about as perfect as it could be for the time of year -- almost glassy smooth seas and warm (-ish) weather, or at least temperatures that made it bearable to stand outside with a parka on. 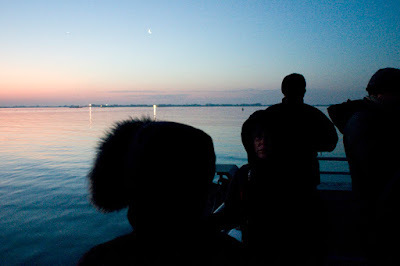 We cruised out of Jones Beach inlet as the sun rose, and many of us were out there birding as soon as we could make out shapes on the water. Like in many forms of birding, the more eyes you have looking for birds the better, and it's especially true when you're scanning the vast ocean for a tiny dark bird. 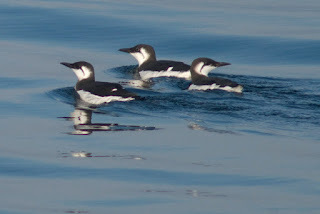 Within half an hour of leaving the dock we spotted our first pelagic birds, a small group of Razorbills. From there we periodically found Atlantic Puffin, Common Murre, more Razorbill, Northern Fulmar and Kittiwake. Once out a little further, we started chumming off the back of the boat (note to self: roll up sleeve before reaching in chum bucket to toss stinky fish to gulls), and got a fair sized group of gulls following the boat. Among the normal Herring and Greater Black Backed we also had a couple of Glaucous and Iceland Gulls, as well as Lesser Black Backed. We also had some marine mammals -- great views of Fin Whale (the second largest whale, after the Blue), and various dolphins. In addition to these photos, I've posted more here. Overall it was about as good a day as I could expected. The boat was great (even a galley! 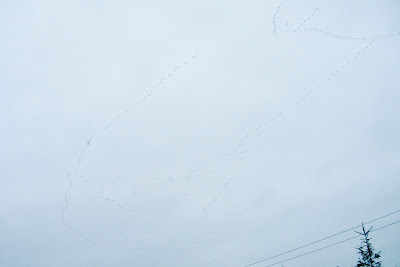 ), we saw lots of great birds, and it wasn't sleeting. By the time we pulled back into port at 6pm I was ready to go lie down on the sofa and pass out (missed the Superbowl...sounded like a great game). When I woke up this morning, I could have easily gone back out on the water...I can see why people love these trips!